Include the following evidence-based OASIS C/C1 best clinical practices for (M2020) Management of Oral Medications: the patient's current ability to prepare and take all oral medications reliably and safely, including administration of the correct dosage at the appropriate times/intervals. 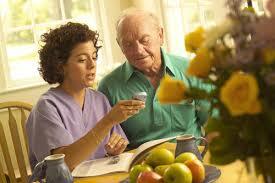 0 - Able to independently take the correct oral medication (s) and proper dosage (s) at the correct times. (b) another person develops a drug diary or chart. 3 - Unable to take medication unless administered by another person. NA - No oral medications prescribed. What is the patient’s current ability - not willingness - to accurately take oral medications? • Includes all prescribed and OTC (over-the-counter) medications that the patient is currently taking and are included on the plan of care. • Exclude topical, injectable, and IV medications. • Only medications whose route of administration is p.o. should be considered for this item. Medications given per gastrostomy (or other) tube are not administered p.o., but are administered "per tube." • If the patient sets up her/his own "planner device" and is able to take the correct medication in the correct dosage at the correct time as a result of this, select Response 0. • Select Response 1 if the patient is independent in oral medication administration if another person must prepare individual doses (e.g., place medications in a medi-planner or other device) and/or if another person in the home must modify the original medication container to enable patient access (e.g., removing childproof lids, marking labels for the visually impaired or illiterate), or if someone in the home must develop a drug diary or chart which the patient relies on to take medications appropriately. • Select Response 3 if the patient does not have the physical or cognitive ability on the day of assessment to take all medications correctly (right medication, right dose, right time) as ordered and every time ordered, and it has not been established (and therefore the clinician cannot assume) that set up, diary, or reminders have already been successful. The clinician would need to return to assess if the interventions, such as reminders or a med planner, were adequate assistance for the patient to take all medications safely. • If the patient’s ability to manage oral medications varies from medication to medication, consider the medication for which the most assistance is needed when selecting a response. • If a medication is ordered prn, and on the day of assessment the patient needed a reminder for this prn medication, select Response 2. If the patient did not need any prn medications on the day of the assessment and therefore no reminders were necessary, assess the patient's ability on all of the medications taken on the day of assessment.